Ann initially came to the practice as she wanted to get a part time job as a 16 year old wanting to buy a stereo system with her own earnings. She is still at The Optical Shop today. She is as enthusiastic now with all our patients as ever, managing the front of our shop. She was born and raised locally and is very well known by our long standing local patients over the last 3 decades. She has vast experience of customer service and always strives to do her best for the customer with her amiable manner and an ever ready smile. Yunus is a biomedical undergraduate studying at the University of Hertfordshire. He works part time at the shop and is keen on customer service and likes to think outside the box. He is always thinking of how to raise the bar in terms of customer service and increasing the footfall of patients to the clinic. Dipti came to the shop with experience of having worked and managed a Superdrug store. She is a university graduate and speaks several languages. She also has vast experience of customer service and always strives to do her best for the customer. Although Ashish has been associated with the practices since 2007, he formally joined three years ago and has taken on a greater role in the management of the practices as well as studying at the Association of British Dispensing Opticians College for a diploma in Dispensing Optics. He has experience of both working in commercial and retail sectors in customer service and risk management. Sunay started off as an apprentice doing her vocational training at The Optical Shop whilst learning to be a dispensing optician at City & Islington College. She now works for both Moorefields Eye Hospital and The Optical Shop as our principal dispensing optician. Her goal is to provide the customer the best solution to meet their needs in the most professional manner. Sital qualified as a Dispensing optician in 1991, and works at several independant opticians for the last 24 years. 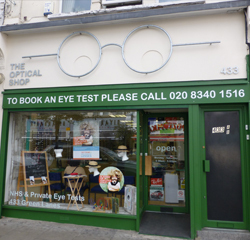 Her ethos is that the patient should have the best spectacles to meet all their needs. She ensures that every patient has ample time to spend with her so that she can meet their requirements. Proud father of two, Suhail works full time with Moorefields satellite clinic in Watford but also loves the independence he has at the practice. He brings across a vast knowledge and experience for the benefit of our patients. Suhail graduated from City University in London circa 2001. Parita studied Optometry at Aston University in Birmingham in the early 1990’s. She has vast experience and further qualifications in seeing patients with Diabetes, Glaucoma and Cataract. She has direct contact with several ophthalmologists through providing these further enhanced eye examinations. Parita is not only involved in providing the best clinical care for her patients, but also is involved in steering the face of optics in our local community through being an active member of the Barnet Enfield and Haringey Local Optical Committee. Jessica has vast clinical experience in optometry. Her knowledge as a contact lens practitioner is second to none, which allows her to fit ‘complex’ eyes with contact lenses. Jessica has a huge following of patients and is very well known in her community for her clinical experience. She has direct contact with several private ophthalmologists through networking over the years. Locum Opticians to the practice are very carefully vetted. Their work is analysed by Parita to ensure they are providing the same level of care that is the ethos of our practices. Clinical care is and will always remain our greatest professional priority.